John’s Horror Corner: Train to Busan (2016), a thrilling Korean zombie film mixing Snowpiercer, 28 Days Later and World War Z! MY CALL: One of the better zombie films I’ve seen in a while, and featuring gorgeous shots and excellent characters. This is a major win and a thrilling ride, mixing the best of 28 Days Later (2002) and World War Z (2013) with a dash of Dawn of the Dead (2004) and Snowpiercer (2013). 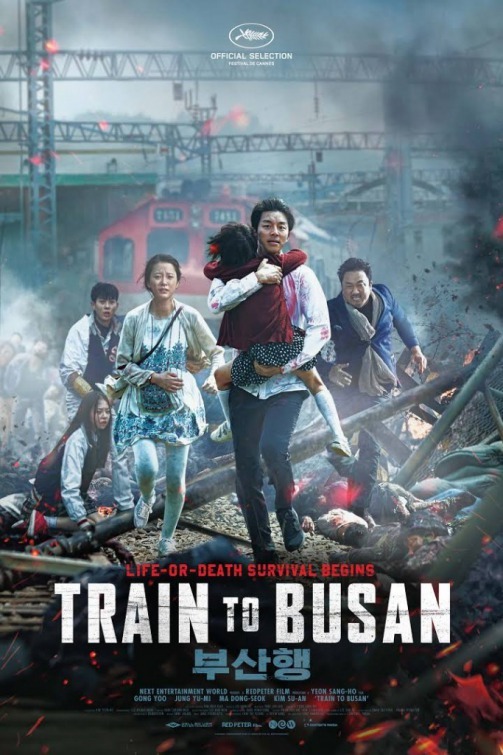 MORE MOVIES LIKE Train to Busan: Other recent, popular Korean horror films include I Saw the Devil (2010), Thirst (2009) and The Wailing (2016). Who’s ready for a serious zombie film? The premise is simple enough: “While a zombie virus breaks out in South Korea, passengers struggle to survive on the train from Seoul to Busan (—IMDB).” It begins when, after a chemical leak from a nearby biotech facility, we witness the startling reanimation of a road-killed deer. In no time the infected turns, bites another, those two infect two more, and in minutes we have a little zombie apocalypse in our train car microcosm. The incubation period for this virus is apparently only seconds, during which the body violently convulses and thrashes, complete with joint cracking sounds and spastic movements throwing back to Raimi’s deadite stylings of the 80s. These speedy viral zombies remind me of the bum-rushing feral undead in Dawn of the Dead (2004) and 28 Days Later (2002). And with this peril, Soo-an (Soo-an Kim; Memories of the Sword) and her father Seok-woo (Yoo Gong; Goblin) find a reason to bond: survival! As Soo-an’s father tries to save her, she voices her sadness that he only cares for himself. During his fight to survive, our once selfish Seok-woo becomes a better man, makes an unlikely friend and both become unlikely heroes brave fearful mobs under mass hysteria driven by the most despicable bad guy of the year! The special effects, physical zombie-acting and stunts are on point. From the zombie deer (CGI; in the opening sequence) to the scores of World War Z-esque (2013) zombies flooding over surfaces like a twitchy deluge, the reanimated movement was perfect and unnerving. They fall from the sky and off buildings, then scramble towards all life with their mouths slack-jawed and their dislocated limbs wildly flailing about. The stunt men must’ve had fun with this, but also likely found challenges with the close-quarter train car combat (think Snowpiercer, but tighter like Oldboy). Between the hyper-scrambly zombies climbing over each other like the spilled-over denizens of a kicked ant mound and the sniveling bad guy who would soullessly do anything to survive, I found myself feistily yelling at the screen about a dozen times. This movie has its real emotional moments (especially getting heavy at the end), but it likewise has its fun thrills! From cityscapes and train station chase scenes, to action sequences in train yards and wide angle convergences of zombie hordes, this film is gorgeously shot. And what a gorgeous framework for a broad cast of likable characters (with even some of the minor roles being quite memorable). I can’t sing its praises enough, but if you want even more reassuring please check out Mark’s 5 Reasons to watch this exciting approach to zombiism that’s fresher than the very flesh it infects. It also made Mark’s 10 Best Horror films of 2016 and was featured in Asian Cinema Takeout #2. Now get up and go watch this movie! ← John’s Horror Corner: Shallow Water (2017), Independent Short Film Review. You just placed this one squarely on my radar. Looks spectacularly cool. Despite all the positive reviews, I probably would have procrastinated for my typical 6-48 months (esp. since I need to be in the right mood for subtitled films) to see it were it not for Mark raving about it at every opportunity. And, you know what, he was justified with every claim IMO. I’m like you, have to be in the right mood for subtitles but this one looks like a no-braaainer!!! Normally I find subtitles in horror/action/effects films to be distracting. And, yes, here it was a tad distracting. But the overall quality of the film kept me from ever feeling like it was a distraction even though, at times, I was frantically reading and diverting my eyes above to the action here and there. Yup. Go see it. See it yesterday. That ending was solid–the wide angle chase shots, the zombie stunts, and the father-daughter-ness. I bought the DVD on your recommendation and watched it this week. Great fun. Appraisal written and inbound. Thanks for the heads up on this one, would never have known if it hadn’t been for your review. I would have shelved this for years had it not been for Mark championing it every chance he had.